Here you will learn about the Gear in Questland! One of the most important items in Questland is your Hero’s Gear. Gear can be equipped either on your Hero or in your Collections. Each piece of gear has a Potential and 4 stats (same as Hero). The stats can be improved by: Upgrading, Boosting, activating Bonuses and Reforging. More on that later. Gear comes in the following qualities: Common, Uncommon, Rare, Epic and Legendary. The higher the quality, the better stats the gear has. However, even same quality gear can have quite different stats, especially when upgraded to max. level. A Gear’s Emblem marks the “family” a piece of gear belongs to. There are currently 16 Emblem types in-game. Only Rare, Epic and Legendary Gear have emblems. You can learn more about Emblems in this article: EVERYTHING YOU NEED TO KNOW ABOUT EMBLEMS. This number indicates how much a gear’s stats will rise with each upgrade. However, it does not say anything about how this number will be distributed between the four basic stats, which is a very important factor. 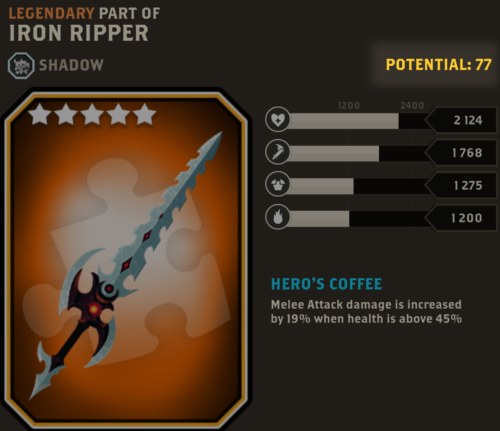 The base stats of Iron Ripper. Iron Ripper at Level 2. 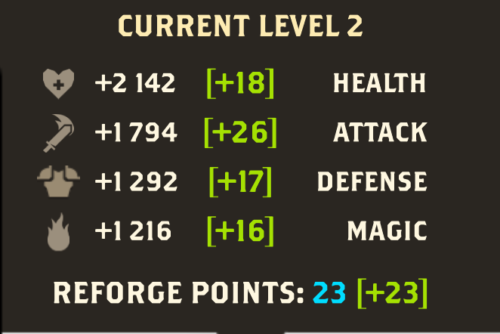 The green numbers show how much each stat increased from level 1 to level 2. If we upgrade this weapon, Iron Ripper, you’ll notice that it’s stats are increased. If you add up all the +’s, you’ll get a total of 77—the Gear’s potential! 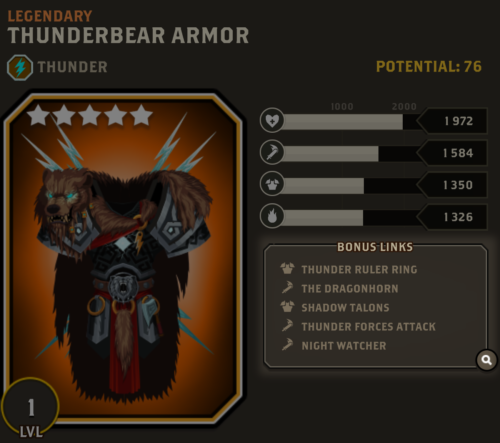 Upgrading Gear increases its stats by a number equal to the Gear’s potential, per level. The maximum Gear upgrade is double a Hero’s level. So if your Hero is level 30, the maximum level you can upgrade your Gear would be up to level 60. This can be partially retrieved later by Dividing your Gear. 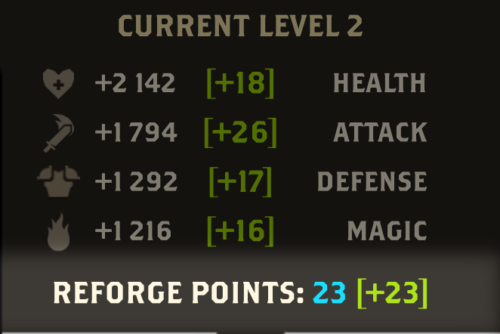 Upgrading Gear also increases its Reforge Points. You can use duplicate Gear for Boosting. Boosting consumes the duplicate and increases all statistics of boosted gear by 1%. 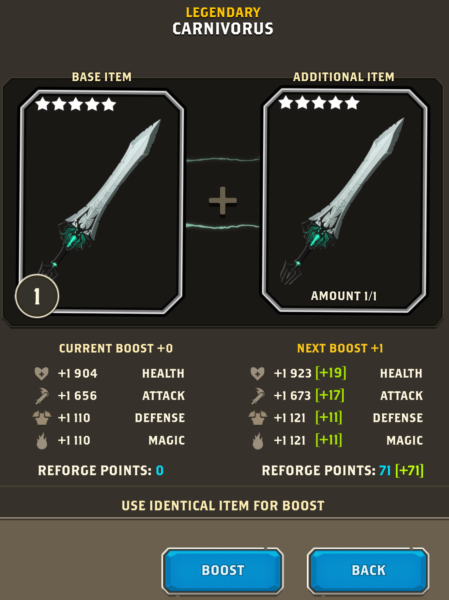 This boost also includes statistics added by Reforge. Also, Boosting adds Reforge Points, which allows you to Reforge your Gear in your Collections. The example below shows how Boosting affects the weapon Carnivorus. If a Boost is available, you’ll see a green arrow on the Boost button. 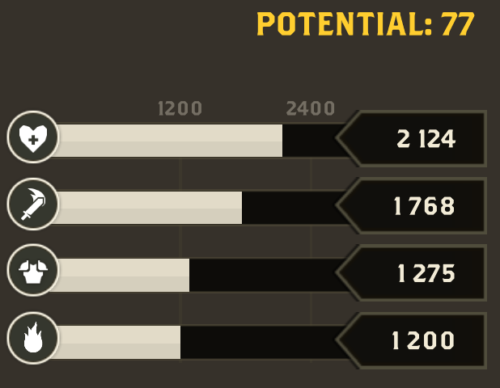 1% of the 1904 Attack stat is 19, which is what the Boosted stat will become. Gear consumed during Boosting can be later retrieved with Dividing. Boosted gear has a special, animated frame icon. The maximum Boost a Gear can have is +20. Every piece of gear, except Main Hand and Off Hand, is linked with other pieces of Gear. Those links are called Bonus Links and when active, they increase a specific Gear’s stat by a given percentage. These can be found right under a Gear’s stats. To see more info, you can tap on the magnifying glass in the bottom right of the Bonus Links area. To activate a Bonus Link, you need to have the required piece of Gear equipped, either on your Hero or in your Collections. Some links require Orbs. In that case, the Orb must be docked in the same slot as the gear. Active Bonuses increase Gear statistics, including those from Reforge. If more than one Bonus increases a stat, their effects are added, not multiplied. Can you guys add an “auto equip” button that can automatically put equipment that would be optimal and with their linked bonus? That option would be very useful in the scroll sections (collection I and II). I would also want my coins back after I unequip an orb (like the Q stone to retrieve Eternium from items). Is there a bonus that activates when you have a combo of gear of the same emblem ? For example, if you have only beast equipement donyou get a special bonus specific to the beast full sets ? We’ll answer this the same way we did with another comment and hopefully it makes sense. 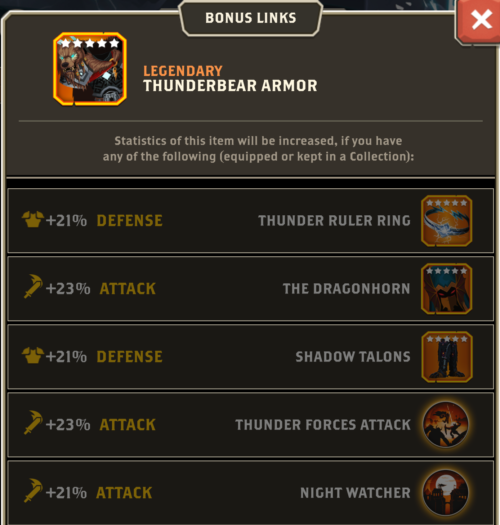 A Gear piece, if you look at it, has different “Bonus Links”. Some of these are from the same set/Emblem, and others aren’t. The Gear you need to give boosts are very specific and can vary from each type of set. For example, the new Manticore Armor Gear (Noble) has boosts with Alabaster Gloves (Noble set), Voltago Horns (Thunder set), and Tricolor Snake Ring (Abyss set). Wearing other “Noble” Gear that is not listed on an equipped item’s “Bonus Links” will not boost it. Hope this answers your question!